As Veggie Girl has mentioned in the previous post, she and I have been sewing lately. For me, sewing is like a drug. I'm enjoying it so much, that I have not experimented in the kitchen lately. Most of my experiments are in front of my sewing machine. But since this is a food blog, I asked a dear friend to contribute something for us here. 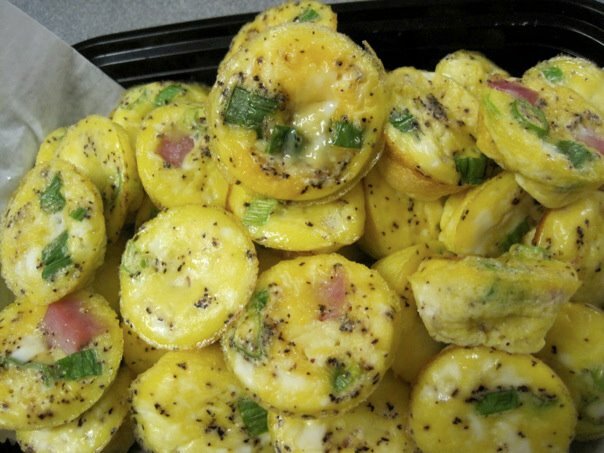 She humbly obliged with her very cute, creative, out of the box thinking frittatas. Now, if I can only make her cook for me so I can continue sewing....LOL! Thanks for sharing Dr. S.
Whisk 5 eggs and add the rest of the ingredients. Use ladle to put the mixture into the mini muffin pan (not up to the brim as the mixture tend to expand). Bake for 15 to 17 minutes at 325F. Makes 24 bite site frittatas. You can serve this fresh or cold. Enjoy!"